Aviation is defined as the design, manufacture, use, or operation of aircraft - in which the term aircraft refers to any vehicle capable of flight. Aircraft can either be heavier-than-air or lighter-than-air: lighter-than-air craft including balloons and airships, and heavier-than-air craft including airplanes, autogiros, gliders, helicopters, and ornithopters. For centuries man has dreamed to soar with the birds. Famous inventors such as Leonardo da Vinci, John Stringfellow, and Lawrence Hargrave have conjured up ideas of how to get some of the strangest machines to fly long before the Wright brothers' famous first flight at Kitty Hawk. The first form of an aircraft was the kite, designed in the 5th century BC. Later on in the 13th century, Roger Bacon, an English monk, performed studies which later gave him the idea that air could support a craft just like water supports boats. In the 16th century, Leonardo da Vinci studied birds' flight, and later produced the airscrew and the parachute. The airscrew, leading to the propeller later on, and the parachute were tremendously important contributions to aviation. He envisioned three different types of heavier-than-air craft: the helicopter, glider, and ornithopter (a machine with mechanical wings which flap to mimic a bird). Although Leonardo's designs were impractical, seeing they required human muscular power which was insufficient to generate flight with the aircraft he envisioned, he was vital to aviation because he was the first to make scientific suggestions. Some of the more credible developments in actual flight and stability occurred in the 19th century. British Sir George Cayley designed a combined helicopter and horizontally propelled aircraft, and British Francis Herbert Wenham used wind tunnels in his studies and predicted the application of multiple wings placed above each other. Another famous inventor was John Stringfellow, who designed a steam-engine powered aircraft which was launched from a wire. This model demonstrated lift but failed to actually climb. Lawrence Hargrave, a British-born Australian inventor, created a rigid-wing aircraft with flapping blades operated by a compressed-air motor; it flew 312 ft (95m) in 1891. A famous glider developer in the 19th century was Jean Marie Le Bris, a Frenchman who tested a glider with movable wings. Kites also played an important role in the development of aviation: they could be used to test aerodynamics and flight stability. Lawrence Hargrave first created the box kite in 1893, and Alexander Graham Bell developed a gigantic passenger-carrying tetrahedral-celled kite from 1895 to 1910. Some of the most important full-scale model flight attempts were made by Samuel Langley, who created the first heavier-than-air, gasoline-powered engine which actually flew. The 'aerodrome', which he called it, was powered by a 53 horsepower 5-cylinder radial engine and later crashed into the Potomac river on December 1903 -- days before the Wrights' historic flight. Throughout this century, major developments would give inventors a sound basis in experimental aerodynamics, although stability and control required for sustained flight had not been acquired. Most importantly, inventors noticed that successful, powered flight required light gasoline engines instead of the cumbersome steam engines previously used. From 1903 to today, it's remarkable how far aviation has come. On December 17, 1903, at 10:35 a.m., the Wright brothers (Orville at the controls) made the first heavier-than-air, machine-powered flight which lasted 12 seconds and spanned 120 feet. Their first flight was 102 feet short of the wingspan of the C-5 Galaxy today, yet they did what every man and woman has dreamed for centuries … they flew. Yet, not all flights were victorious, on September 17, their aircraft crashed, injuring Orville and his passenger (Lieutenant Thomas E. Selfridge). Selfridge later died of a concussion and was the first person to be killed in a powered airplane. Yet the show went on and Wilbur went to France in August 1908; on December 31, 1908, he completed a 2 hour 20 minute flight which demonstrated full control over his Flyer. The Flyer was purchased on August 2 and became the first successful military airplane. It remained in service for around two years and was retired to the Smithsonian Institution where it rests today. Well-known in the aviation field by this time, Glenn Hammond Curtiss won the first American award, the Scientific American Trophy, for an airplane flight when he flew the 'June Bug' 5090 ft (1552m) in 1 min 42.5 sec on July 4, 1908. Curtiss also went on to win the first international speed event, at about 47mph (75.6 km/h), on August 28, 1910. He also became the first American to develop and fly a seaplane -- the first successful seaplane flight having been done by Henri Fabre of France on March 28, 1910. Before World War I, airplane design greatly improved. Pusher biplanes (two-winged airplanes with the engine and propeller behind the wing) were succeeded by tractor biplanes (two-winged airplanes with the engine and propeller in front of the wing). Monoplane designs were rare, and when World War I began, huge biplane bombers with two to four engines were developed. Airmail was also started, although it only lasted a week. The first airmail officially approved by the U.S. Post Office Department began on September 23, 1911, and the pilot (Earle Ovington) would carry the mail on his legs and tossed the bag overboard when he reached his destination. Also in 1911, the first transcontinental flight across the U.S. was completed by Calbraith P. Rodgers. His flight from New York to California took 3 days, 10 hours, and 14 minutes, and was by a Wright aircraft. Between 1919 and 1926, some amazing progress in record breaking for aviation took place. Captain E. F. White made a nonstop flight from Chicago to New York (727 mi - 1170km) in 1919, and Lieutenant Oakley Kelly and Lieutenant John A. Macready made the first nonstop transcontinental flight from May 2 to May 3, 1923. This flight was made from Roosevelt Field, Long Island to Rockwell Field, San Diego. The first round-the-world flight was made from April 6 to September 28, 1924. Also in 1919, the first nonstop transatlantic flight was made by John William Alcock and Arthur Whitten Brown on June 14 to June 15. It took a little over 16 hours to complete and they won the "London Daily Mail" prize of $50,000. Mail delivery also took a major turn during these years. In 1925, Congress passed the Kelly Air Mail act which authorized the Post Office Department to contract with air-transport operators. This made it possible to transport U.S. mail by air; after this, 14 domestic airmail companies were created in 1926. During World War II, aircraft became a decisive factor in warfare. The largest operator of all international airlines in operation at this time was Pan American Airways. Pan American served 46 countries and colonies linking all continents and nearly all oceans. Small aircraft production increased significantly. Before World War II only about 193,000 people were employed in the aviation industry, and during 1941 the number increased to 450,000; also, around 3,375,000 passengers were transported by 18 U.S. airlines at this time, around 1 million more than in 1940. Airmail and express cargo would also increase by around 30 percent. But by the end of World War II, a new frontier of flight would take shape, jet and rocket propelled aircraft. After World War II and by 1947 all the basic technology needed for aviation had been developed: jet propulsion, aerodynamics, radar, etc. Civilian aircraft orders drastically increased from 6,844 in 1941 to 40,000 by the end of 1945. One of the minor military contractors was the Boeing Company who later became the largest aircraft manufacturer in the world. With all the new technologies developed by this time, airliners were larger, faster, and featured pressurized cabins. New aerodynamic designs, metals, and power plants would result in high-speed turbojet airplanes. These planes would later be able to fly supersonically and make transoceanic flights regularly. One of the more famous record-breaking flights around this time was the Voyager, developed by Burt Rutan. The aircraft held 1,200 gallons (4500 liters) of fuel in its 17 fuel tanks. It weighed about 9,750 lb (4420 kg) at takeoff and only 1,858 lb (840kg) upon landing. The flight, maintaining an average speed of 115.8 mph (186.3 km/h), lasted 9 days, 3 minutes, 44 seconds and covered 25,012 miles (40254 km) and was completed in December 1986. 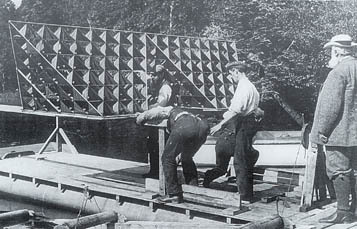 Alexander Graham Bell's tetrahedral kite photo courtesy Canada's Digital Collections. Wright Brothers' first flight photo courtesy AeroWeb. Voyager photo courtesy Dryden Flight Research Center. http://www.encyclopedia.com © 2000 Columbia Electronic Encyclopedia. 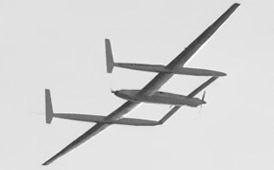 "Early Flight," About, Inc. http://aviation.about.com © 2002.